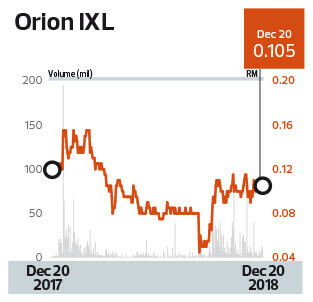 ORION IXL Bhd has set a target is for its financial technology (fintech) solutions business to provide at least 40% of revenue by the end of its financial year ending June 30, 2019 (FY2019), says CEO Mohamad Shaharul Mohamad Shariff. Orion IXL recently signed a 15-year agreement to develop and operate an online end-to-end loan application system, which will go live by next month. Filings with Bursa Malaysia show that its wholly-owned unit, Ganda Integrasi Sdn Bhd, signed the technical services agreement with the group’s 10%-owned affiliate Sukaniaga Sdn Bhd. This follows a service-level agreement between Sukaniaga and MyAngkasa Holdings Sdn Bhd (Angkasa) for the development of the fintech system, called Angkasa Az-Zahara. Angkasa is a wholly-owned subsidiary of Angkatan Koperasi Kebangsaan Malaysia Bhd, which represents the cooperative movement in the country. Shaharul says the move is part of the strategy to expand the group as a technology company. It aims to achieve 1.2 million cumulative transactions using the financial transaction management system (FTMS) within three years. With this in mind, Orion IXL has undergone some digital transformation and technological advancements in blockchain, artificial intelligence (AI) and big data analytics. “We knew that we needed some kind of technology advancement. [We went for] blockchain to ensure security and transparency, AI for its predictive power based on large amounts of data and, third, big data technology to help us manage the huge amount of data for this type of financial transaction,” Shaharul says. With a core engine, he says, the group can build a complete fintech system that caters for many financial transactions. “One of our cores is the credit scoring system we have developed. It is unique in that we have gone beyond CTOS and CCRIS, which are used by conventional scoring systems, adding other kinds of data to evaluate our credit scoring. “For example, a traditional scoring system talks about your past financial transactions or habits based on CTOS and CCRIS data. It cannot estimate how much your earnings will be in the next two years because they do not take [salary] increments into consideration. If someone is in the media industry and it is expected to see strong growth over the next few years, that would have an impact on your earnings. Now, with the technology that is available, we can have a credit score based on your future earnings,” Shaharul says. Recall that in August, Orion IXL entered into a strategic partnership with Scalend Riametric Sdn Bhd to develop fintech solutions and services that incorporate data analytics and AI. Scalend Riametric will provide access and use of its proprietary big data platform to work with the group to pursue additional business development opportunities with existing and prospective customers. Scalend Riametric will also grant rights to white-label its big data platform with Orion IXL’s brand when it is utilised for the latter’s existing and prospective customers. Shaharul says this is an important step as the group has developed its own credit scoring system using the big data platform, which could be an important solution for people without any credit background or access to financial institutions. “These services can also be used by banks or non-banking institutions,” he says, adding that it gives the company an edge to develop an online application system for clients such as Angkasa. The technology offered by Orion IXL will help level the playing field for non-banking institutions, or more traditional institutions, against fintech players that can approve micro loans or other financial transactions more quickly. Orion IXL is also adding new capabilities such as its rent-to-own system, which can be incorporated into its existing computerised maintenance management systems (CMMS) business — the group’s main source of revenue. Beyond technology, the group is embarking on a new sustainable business model, which it aims to replicate outside Malaysia. “In today’s climate, companies are reluctant to commit to capital expenditure. We have to change our business model. That is why we decided that [clients] do not have to invest anything. We bring in the system and charge for every successful transaction in a 15-year deal. That is the deal we made with Angkasa,” Shaharul says. With the group taking a percentage of every successful loan transaction done using the system, the business model gives Orion IXL long-term revenue and stability. Shaharul says there is a lot of manual work involved in the loan application process at most corporations. The FTMS provides solutions to some of the risks involved with manual work such as human error and malpractice. “What our system does is prevent the risk of human error and accelerate the loan process … That is why Angkasa is interested in our FTMS because it gives it an advantage to compete with other players,” he says, adding that for corporations to build their own systems, it would take time and investment. Shaharul says there is a clear advantage for Angkasa — big data for its large quantity of data, a credit scoring system that helps with the loan approval and blockchain to ensure the security and transparency of the system. He says a lot of other cooperatives and non-banking institutions in the region are struggling with similar issues and Orion IXL hopes to tap this market following its deal with Angkasa. These developments at Orion IXL follow some major boardroom changes and a capital exercise. Prior to this, the group was known as CWorks System Bhd — a loss-making CMMS provider that was linked to Datuk Mohamed Nizam Razak, the brother of former prime minister Datuk Seri Najib Razak. Nizam, who was a substantial shareholder of Orion IXL, or CWorks, in 2005, has seen his interest diluted to 1.97% based on its 2018 annual report. Over the 18 months ended June 30, the group recorded a net loss of RM1.54 million on the back of RM13.4 million in revenue due to the liquidated ascertained damage charges of RM1.1 million attributable to the ongoing management information system project undertaken by its wholly-owned subsidiary, ASAP Sdn Bhd. Orion IXL had completed the acquisition of the entire equity interest in ASAP during that period as ASAP and Orion IXL provide solutions of a similar nature. The acquisition allows both companies to explore potential synergies in technology, expertise and client base. Under the corporate exercise, ASAP has given Orion IXL a profit guarantee of RM7.5 million per year or a RM15 million cumulative profit after tax for two years. Compared with a year ago, the group’s share price was down 12.5% based on its closing price of 10.5 sen last Thursday, giving it a market capitalisation of RM62.9 million.